Extreme sports are often considered a "no-no" for pregnant women, but a pregnant skydiver who was unaware of her condition brought high-risk sporting while pregnant into the spotlight. "To hit the ground belly first - that's dangerous. I mean at any stage of pregnancy that's dangerous," Richardson said. "That's not something you want to do let alone at 50 miles per hour." Despite needing several surgeries and having a broken pelvis, Richardson (now married to Rick West) gave birth to a baby boy on June 17, 2006. Debate over whether or not the accident was caused by human error or malfunction occurred after the incident. Research on extreme sporting activities as exercise is slim to none. Most doctors recommend that pregnant women do not engage in these high risk activities. Leanne Critchley presented a report she compiled called Pregnancy & Skydiving at the Skysister's United Women's Skydiving Event in Australia in 2005. Information relating to this presentation was cited in an article by Wendi Rogers called Jumping a Round. Am I an experienced skydiver? Do I have other medical conditions that would complicate a dive? Have I maintained my physical fitness throughout my pregnancy? Does my doctor have valid concerns regarding jumping or lack of jumping? Although the report provides a number of positive stories relating to pregnant skydiving, women should always discuss any pregnancy exercise with their doctors. The opportunities to dive will still be available after the baby is born, so if a pregnant woman or her doctor has any qualms about diving, she should consider quitting until after birth and postpartum recovery. While a number of women continue to engage in extreme sports activity while they are pregnant, it really is not a good idea for most. 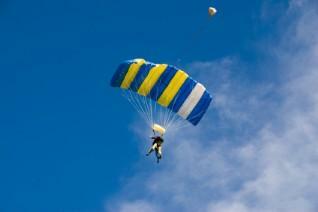 Sporting activities like bungee jumping, skydiving, or ski-jumping carry the risk of falling. The baby itself may be protected during a fall, but impact may cause an abruption of the placenta from the uterus. Skydiving schools and other extreme sporting centers often have regulations regarding allowing a pregnant woman to jump. For example, the Grand Bend Sport Parachuting Center recommends waiting a few months after giving birth before resuming (or starting) diving to give the mother's body a chance to recover. Additionally, they state that a woman more than a few weeks along in her pregnancy should not jump. To stay in shape, doctors often recommend yoga, walking, and swimming as healthy ways to have a fit pregnancy. Women concerned about weight gain can also follow diet and nutrition guidelines. Shayna Richardson (West) was a pregnant skydiver who not only lived through her free fall, but gave birth to a son several months later. Women who know they are pregnant should weigh the pros and cons, along with the risks to themselves and their unborn children, with their significant others and doctors to make an informed decision before continuing with the sport.